Beloved by many leading bridal magazines and blogs, as well as a whole lot of brides, Rachel Attwell is the founder of Luella’s Boudoir, bridal boutique extraordinaire and providers of plenty of gorgeous vintage styling inspiration as well as a whole lot of stunning Wedding must-haves! Rachel is the inspirational brain behind the brand, and was inspired to open Luella's Boudoir after planning her own wedding in 2005 - with a busy career, and limited time for planning and wedding shopping, she saw the need for a boutique which housed a huge selection of wedding loveliness and a cross section of brands, and offered in-house styling advice too. Luella's is also a one-stop haven for those in need of some wedding assistance with their range of Wedding styling and planning services. From full coordination packages right through to just a little help in the way of inspiration with their consultation service, and their in-house Bridal Coordinator is a specialist in Vintage Wedding Design from 1920s through the swinging 60s. All this AND set in a gorgeous girly boudoir-style haven tucked away in Wimbledon - what more could a Most Curious Bride want? We are so excited Rachel is going to be joining us as a judge for bridal NEXT! and know that the abilities that have taken her fab brand from strength to strength make her very well placed for the part. 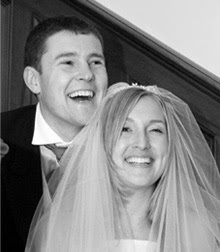 1) You got married back in 2005 - tell us all about your dress! Do you also think you would do it differently if you were getting married this year instead? My dress was a very simple, strapless, A-line style and it was all about the fabric and the cut of the dress as opposed to any detailing. I firmly believe that brides should look effortlessly elegant on their wedding day and since I am quite a simple style dresser normally, this style was perfect for me. If I was getting married now, I would definitely choose something a bit less traditional but it would still have to be made from a really nice quality fabric. One of Sally Lacock's lace designs, Caroline Atelier's simple styles or this stunning dress by Charlotte Casadejus would be perfect. 2) What was the most important thing planning your wedding - and was this the same as what was the most important on the actual day itself? The most important thing I did when I was planning my wedding was to involve all my family and friends in some way. I did lots of little social things with everyone along the way so by the time the day came they were almost as excited as we were! Most of my friends and family still say it was the best wedding they have ever been too and I don't think that it's because of any one particular detail....it's just because they really enjoyed sharing our day with us. I am working with a number of really great designers that have really gone from strength to strength over the last few years - designers such as Charlotte Casadejus, Victoria Fergusson, Rachel Simpson and Love by Susie as well as some brand new designers including Vicky Rowe, Saving Face jewellery and Cherished Vintage. It's really nice to be sharing that journey with them and to watch them grow and flourish as they go from strength to strength. 4) What will you be looking for at Bridal NEXT! ?I will be looking for someone that has created something really new and interesting. There are lots of new designers entering the wedding industry right now but they aren't necessarily offering something different and sometimes the quality isn't there. They will also have to have thought about how commercially viable their product is in terms of the production costs, distribution etc. It's really exciting to be involved in this project!! We are currently working on updating our website. We have some great new designers coming onboard this autumn and I really want to be able to showcase their collections in the best possible way, so watch out for plenty of exciting new things! A banana because I am on a diet, my iPad because I seem to be permanently attached to it and of course lots of paperwork! And check out this stunner - one of our personal favourites from Luella's Boudoir, this amazing vintage wedding dress is by Vicky Rowe - yummy! As well as Rachel joining us as a judge, you'll see a selection of Luella's finest Wedding dresses sashaying down the runway in our London catwalk show - what more reason do you need to check it out? !